In the midst of an ongoing and unprecedented presidential war on the mainstream press , President Donald Trump has relied heavily on a handful of sycophantic fringe media outlets to unquestioningly push his message and offer him unconditional praise. 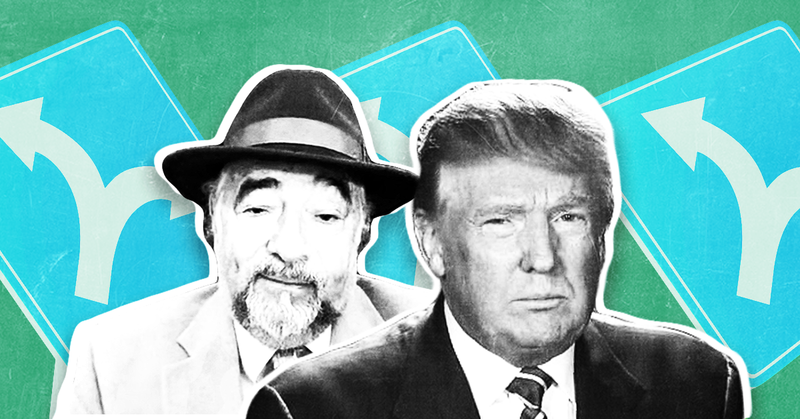 One of Trump’s favorite radio shows for this purpose was Michael Savage’s The Savage Nation -- until now. Savage heavily supported Trump “from the get-go,” coupling overwhelming praise for Trump with vitriolic hate rhetoric on a daily basis and sometimes taking credit  for inspiring Trump’s campaign messaging. Savage and Trump were often partners in broadcasting an alternate reality -- where the world is a scary place that can be saved only by a heroic and charming Trump -- to 10 million listeners each day. Trump made his first appearance on Savage's radio show in 2011  to discuss whether he would ever run for president. Since Trump formally declared his presidential candidacy in June 2015, he’s appeared on The Savage Nation at least 16 times, including on Election Day, to participate in acts of performative mutual admiration with the host. Members of the Trump administration have also appeared on the show several times this year to push conservative talking points about health care, the Paris climate agreement, and foreign policy matters. MICHAEL SAVAGE (HOST): I am not a journalist. I’m a talk show host. I have opinions. I’m biased. Period, end of story. The rest of them all are biased. They don’t tell you that, though. I’m for Trump. Point-bank. Best choice we have. Donald Trump joins us right now on The Savage Nation. Donald, thank you for being with us. What’s on your mind today? DONALD TRUMP: An honor. That’s an amazing honor for you to say that -- is tremendous. I appreciate it, Michael. SAVAGE: But Donald, why should I hide it? I mean, people make believe that they’re not biased. You know and I know the media’s biased one way or the other. They all pretend that they’re scientists in a laboratory with a pipette in their mouth. They’re all biased; they all have an axe to grind. Look what they’re doing to you: smearing you every day with lies. Garbage, pure garbage. Where they let Obama get away with virtual murder, give the bomb to Iran. Why is the media not saying one word about what Obama is doing to wreck this nation, Mr. Trump? MICHAEL SAVAGE (HOST): People are saying Trump’s running hot right now, but it’s a long race. It’s over a year to go. But you’re engaged in this campaign every second, every day. No one knows how you get the energy for it, god bless you, but they’re saying that you’re going to peak, you’re going to drop out. How the heck do you maintain your stamina, Donald? Is there a secret? SAVAGE: You are, by a huge margin. You’ve struck a cord. People are trying to explain it, the very people who attacked you in the beginning are now suddenly coming around saying, ‘Well, maybe he’s not so bad,’ because they’re hedging their bets that you just might win. I feel you will win if you sustain it. And the only thing I ask out of the support for you is simple: I only want to run the NIH and I want to clean up the science and medical establishments in America, which are as corrupt as you can imagine. They’re doing no basic science. Medicine has been corrupted by politics. Instead of producing scientific reports everything has to have something to do with global warming in it or gender identity. SAVAGE: We have a problem -- at every level of this country has a problem and it wasn’t started by Obama but I hope it’s ended by Donald Trump. DONALD TRUMP: You would be so happy. If I win this thing, you will be so proud of this country, Michael. I’ll tell you what. MICHAEL SAVAGE (HOST): Well you know, I’ve got to tell you, Donald: On a personal level, you already make me hopeful. You already make me more proud to be an American. And you’ve given me something personal that you don’t even know. I’ve worked very hard as an immigrant’s son to achieve what I have. And as you know, my family has worked very hard. They’ve achieved a lot. But we’ve had to hide it under the Democrat-Socialist machine. We’ve almost had to apologize for having succeeded, for working so hard. I feel proud for what I’ve achieved because of you, Donald. Because you’re willing to stand up and say you’re proud of what you’ve achieved, you make me willing to stand up and say that. Do you know that you’ve had a positive effect already? MICHAEL SAVAGE (HOST): I thought that after I criticized you on-air -- and I did it as delicately as I could -- that I wouldn’t be eating lettuce at Mar-a-Lago ever again. But I’m glad to see that you’re a bigger man than I am, and you came back on the show because you can take criticism. And, by the way, that’s more than what most politicians are willing to do, Donald. You know and I know that most politicians are so thin-skinned that if you dare say one word about them that they don’t agree with, they excommunicate you. And you did not do that with me, I’ve got to tell you that. DONALD TRUMP: No. Look, I understand that you weren’t happy about that but, your show has always been good. You’ve always been good to me, other than the last couple of weeks -- you didn’t like what I said. But at some point -- why, are you a noncompetitive person? You wouldn’t do it? You would’ve done it five times worse than I did it, OK? SAVAGE: [laughter] If I were in your place and I had a chance to knock Carson? I think that what gets you about Carson is that he acts like such a nice -- I think what was getting your goat, looking back, knowing kind of a little bit more about you as you have evolved on the campaign trail, is that you didn’t like him getting away with that he’s such a nice guy, and so sort of unaggressive when under the surface you’re saying there’s a monster lurking under the surface. Is that sort of what it was? TRUMP: He’s got some deficiencies and they’re pretty big and I wanted to let him know. And you understand that. You would’ve been worse than me, I’m telling you, OK? I know you too well, Michael. You know, you’re trying to be this nice guy, don’t hit -- since when don’t you hit people hard? TRUMP: By the way, if you didn’t hit people hard, your show wouldn’t be the success it is either. So, always good to do your show, you know that. MICHAEL SAVAGE (HOST): Donald, I won’t take up any more of your time. I want to thank you for being on The Savage Nation. I hope to see you back here as soon as possible. Good luck in every one of your campaigns. I hope to share some Cobb salad with you, and meatloaf, at Mar-a-Lago. MICHAEL SAVAGE (HOST): Donald, before you go -- I’ve been backing you from the day you started. We have nothing in common, meaning we don’t have business together. We don’t do business together. There is no deals (sic) between us. I just want the best for America. I want a winner. I want someone who can take on ISIS, I want someone who can defeat China in negotiations, I want Mexico to stop flooding us with immigrants. Now we have the Zita (sic) virus coming in from South America. This is insanity, Donald. You’re the only candidate who can do this. And I know women -- smart women, business women who are very wealthy, built their own business, Donald -- every one of them, some of them are even liberals, are backing you. Do you know that? DONALD TRUMP: I think it’s so great. I think we’re going to do even better than the poll numbers are showing. I hope. You know a lot of people are saying that, where the polls are so great but we may do better. But who knows? We have to see. Hey look, I’m working hard and a lot of people are working hard and we have such great support, but we still have to get there and I don’t want to take anything for granted. I always like to say there’s a long way to go. But I will say this, just to finish off: If I get there, you will be very proud. And you have been an original backer from a long time ago and I appreciate it, Michael, and I’ll never forget it. SAVAGE: I know you don’t. That’s something people don’t understand about you and they don’t understand about the winning personality -- is that you never forget your friends and you never forget those who put knives in your back. Donald Trump, all I can say is my audience is 98 percent behind you. I’m sorry it’s that low, but I’ll work on the other two percent over the coming weeks. MICHAEL SAVAGE (HOST): Doctor Trump, you’re the doctor that we need to heal America. DONALD TRUMP: Amazing, Michael. It’s been an amazing period of time. And I mean, I’m in Iowa right now. In fact, I’m going to make a speech in about 9.2 minutes but I said I have to take Michael before I get up. I mean, I have to speak to you. You’ve been so supportive and I want to thank you, Michael. DONALD TRUMP: One thing about you, Michael: You’re a very consistent person, like me. MICHAEL SAVAGE (HOST): That’s right. And that’s why people don’t like us. In a world of malleable, changeable positions, we are like mountains, Donald. And they don’t like mountains. They want to grind us down into sand. MICHAEL SAVAGE (HOST): The most important candidate in modern American history, Donald Trump, live right now on The Savage Nation. Mr. Trump, thanks so much for taking the time on Super Tuesday to give us a super interview with you on The Savage Nation. DONALD TRUMP: Right. Thanks, Michael. SAVAGE: Donald, I want to put something to rest. I know that you’re the least racist person of all of the candidates. I know it from your employees, I know it from your history. But you’ve also been smeared continuously with this KKK garbage. And I know you’ve denounced it. Can you clearly say that you denounce this endorsement on The Savage Nation? MICHAEL SAVAGE (HOST): Before you go, Donald. You’re a businessman. People don’t understand business. Socialists like Bernie Sanders who never ran a corned beef stand don’t understand that business means some businesses succeed and some fail. So what they do, like the creeps at the [New York] Daily News, they come up with some of your ventures that didn’t work, they try to make it look like you’re a crook or a bad businessman. What they don’t understand is that business is a gamble. Some businesses work, some fail. Isn’t that true? SAVAGE: And that’s something that the college class of spoiled, inheritance cases don’t understand. Guys who say you inherited the money from your father. I happen to know from having read everything I could about you and your great father was he didn’t give you a lot of money. He have you an initial seed loan, which you paid back. Your father was a great man, yet they even smeared him. Here’s a man who built apartment houses all over middle-class Brooklyn and Queens, and they made him into a bad guy for doing it. So what more can you expect from these people? They’ve never built a thing in their life, Donald. MICHAEL SAVAGE (HOST): Donald, we're only interested in one question, and I heard some of your Today interview today, and that is the Islamo-fascist attack in Belgium. I know that you are shown to be 100 percent right by this attack when you said that you wouldn't admit anymore Muslims into the United States until we "figure this thing out." You were 100 percent right. But here's the question, Donald. What would you do about the radical mosques in America? Would you agree right now on The Savage Nation that you will consider closing the radical mosques in America? Because even liberal France has been doing this since the Paris terror attacks. I have to repeat this: Liberal, socialist France, even they have closed about 20 radical mosques because they decided that they want to live. Mr. Trump, what do you think should be done? MICHAEL SAVAGE (HOST): Here he is, the great man himself, Donald Trump. Welcome to The Savage Nation. Donald, thanks so much for being with us and, by the way, congratulations on the birth of your newest grandchild. DONALD TRUMP: Absolutely, that’s great. Really happy about it. MICHAEL SAVAGE (HOST): Without further adieu, the man of the hour, Donald Trump. Welcome to the program, Mr. Trump. SAVAGE: [laughs] Now I know that they’ve tempered you, Donald. Somebody behind the scenes is starting to temper you a little bit. You’re giving me a compliment -- that’s a good sign. MICHAEL SAVAGE (HOST): Mr. Trump, welcome. You survived the assault today. DONALD TRUMP: How are you? MICHAEL SAVAGE (HOST): I was on a TV show last week and a guy said to me, “Why do you support Donald Trump? He wants to make America great again. What does he want to do, take us back to slavery and the Great Depression?” I said, “What, are you crazy? What does that have to do with today?” And you know, that’s how crazy they are in the press. This was a major-league guy who said he was your friend, Donald, I swear to God. He said, “What, does Donald want to take us back to slavery?” I said, “What, are you nuts?” This is what we’re dealing with. DONALD TRUMP: So somebody that said he was my friend? That’s interesting. Am I allowed to know who it was? That’s amazing. MICHAEL SAVAGE (HOST): Everyone is so thrilled that you came back to the show, and I’m an honest guy in the media. I kind of say it like I feel. I don’t think as carefully as I should somehow. But the fact is people were saying, “Hey, where’s Donald Trump? Now that he’s so popular, he won’t come back. He’s moved to the center.” I said, “No, no, no. Just wait. He’ll be back. He’s true to his core.” So, again, I have to say that’s what they’re saying now all over my Facebook. “Thank God Trump is back.” And, yesterday you said you were going to build the wall. You confirmed that again, correct? DONALD TRUMP: Oh, a hundred percent. And it is so very popular, we put it in the platform. It’s in the Republican platform, I don’t know if you saw that, but that was sort of one of the things that I’m very proud of. We did something else for the Evangelicals which is going to be fantastic. We’re going to get rid of this Johnson change that was made years ago where it takes the power away from Evangelicals and others of religion. And you’ll see some things happening there that are going to be very good. We have some very good things put in the platform. One of the things put in, though, is the wall. And as far as being back here, you’ve been so amazing to me, Michael. Of course I would be back. I never heard anything, otherwise I would have called you five different times already. MICHAEL SAVAGE (HOST): Mr. Trump? SAVAGE: How are you? I’m your old friend -- remember me, Michael Savage? TRUMP: Oh, absolutely, Michael. How is Michael? SAVAGE: I have not gone anywhere. I’ve been in your corner even when I couldn’t reach you. I’m so glad that you’re surging in the polls. MICHAEL SAVAGE (HOST): Look, Donald, I don’t want you to say anything that any of the rats in the media could use against you. They’re the most vicious people I have ever seen. But in addition to being vicious, I have never seen attacks against the candidate of the type I am seeing against you. But want to hear the good news? The American people hate the people in the media. Their ratings are the lowest in history because they know they’re liars, Donald. So all we can say is, don’t let them intimidate you. Not that I think you would be intimidated by the likes of those people, but they are trying to smear you simply for stating the obvious and the truth. MICHAEL SAVAGE (HOST): I say it’s life under Trump and death under Clinton. And I mean the death of our First and Second Amendments, for sure. Mr. Trump, you are the only thing we have left between us and pure anarchy. SAVAGE: Donald, where do they get all of these tarts from? Where do these tarts come from? MICHAEL SAVAGE (HOST): Donald, we’re getting calls on the show today in this first hour, with people I asked them what they would like to say to you. And overwhelmingly they’re saying win, lose, or draw you’ve already done the country a great service. You have changed the national conversation, Donald. You know that, don’t you? DONALD TRUMP: Well, I really appreciate. I’ve had thank yous from so many people. You know, it’s a vicious business. I used to think real estate was vicious. Real estate people are like soft people compared to these [unintelligible] for the last year and a half. SAVAGE: [laughter] I can just imagine. I can just imagine. So after this election -- first of all, Donald, I want to thank you personally for showing your loyalty to me personally. I know that you’re not doing a lot of national radio shows today. I know you wanted to come onto The Savage Nation because, in many ways, we had you on before anyone else did on a regular basis, and I know your loyalty is very important to you. I told the people that you’re the most loyal politician I’ve ever encountered in this business. So again, I want to thank you for that. Period. MICHAEL SAVAGE (HOST): With us is a really special guest, and his name is Boris Epshteyn. … He is a fabulous political strategist and he lives in New York City and he has a political view that you can summarize in six words: small government, low taxes, and national security. OK. Mr. Epshteyn, welcome to The Savage Nation. Thanks for being with us. BORIS EPSHTEYN: Thank you so much for having me. I really appreciate it. It’s great to be on. I’m a big fan. SAVAGE: [laughter] Oh, I’m glad to hear you even know who I am, because -- who compiled the guest list for the inauguration? EPSHTEYN: Well, it’s a long process but there are a lot of -- so many Americans reaching out, wanting to take part, and we’re inviting anybody and everybody from all over this beautiful country to come and celebrate with us, be with us, be united with us, and celebrate this peaceful transfer of power with us. SAVAGE: On another point, who in the media is given the VIP treatment at the -- if media people can go, right, they can be sent by NBC, CBS, Fox News, they have their own place, right? EPSHTEYN: Well, there’s a credentialing process. And that process is undertaken by a part of my team, actually, here in the communications department. And we are giving every network, every broadcast, every outlet equal opportunity. So we’re not playing favorites here. SAVAGE: So what if I wanted to go? Michael Savage, who -- I did a lot to help Mr. Trump all those months and no one believed in him, how would I get on that list? MICHAEL SAVAGE (HOST): I had the great honor of being at Mar-a-Lago 10 days ago on a Saturday night when the president appeared. I was hoping he'd be there. I didn't think I'd get so much as a handshake or a hello. But I was lucky enough to be invited to have dessert with the President Trump and he sat with me for over 60 minutes. I thought it was a few minutes. My wife said, "You know you were there over 60 minutes with Donald eating dessert," and I said, "I know. I don't eat dessert but I did for him because I couldn't say no to vanilla ice cream and chocolate syrup even though I haven't had it since I'm a child." He is exactly what he sounds like. He doesn't change privately or publicly as you said. He's a very honest man. He is what he looks like and he believes every word he says. MICHAEL SAVAGE (HOST): It’s a great day for America because, look, if the science supported the idea that man was harming the planet by increasing the carbon dioxide as a result of his activities, I would say so. But the fact of the matter is much of the science today that is being quoted is based upon fake science. You’ve heard about fake news. I have studied the science or I wouldn’t be talking like this. The Democrats don’t even know what they’re talking about. If you asked [Sen.] Sheldon Whitehouse [(D-RI)], who just attacked Trump for saying he’s betraying the country in the service of the Koch brothers, I would say to Sheldon Whitehouse, “Can you sit down with a pen and show me what carbon looks like as a molecule? Please show it to me. And please explain to me how come ancient core samples from the Antarctic show that there was climate change going on hundreds and thousands of years before man industrialized.” He would not have an answer for us, Mr. Pruitt. The science is fake science that they’ve been foisting upon a gullible public. MICHAEL SAVAGE (HOST): I was just telling the audience that I’m the only person in the media -- and it’s true -- that has an actual Ph.D. from a great university in a science. And all the evidence indicates to me that this whole global warming business is hyperbole. But putting that aside, vice president, leaving the Paris accords was good for the country as a whole. Can you please tell us why? MICHAEL SAVAGE (HOST): I was invited to a dinner by my friend from Newsmax, Chris Ruddy. And he had told me that Laura Ingraham would be at the table, my family would be at the table, and several other individuals who will remain anonymous would be at the table. And of course there was no guarantee that I would meet the president. I went there on a chance that I’d have a minute with him or five seconds with him. But I will tell you this: It was longer than five seconds. I sat with the president for well over an hour, alone, in front of the entire club. We had dessert together. Asking listeners to put aside his political orientation for a moment, talk-radio host Michael Savage questioned the federal government's recommendation that citizens get a flu shot. "Did Harry Reid take a flu shot? Did Barack Obama take a flu shot? Did Barack Obama's lovely family take a flu shot? Did Joe Biden take a flu shot?" Savage asked. "Which of the mandarins took the flu shot?" He explained that he was talking specifically about vaccines and was not advocating the avoidance of all pharmaceuticals. Known for his many books on herbal medicines, Savage acknowledged he has benefited from "an awful lot of life-saving regular medicines." MSNBC on Monday fired Michael Savage for anti-gay comments. The popular radio talk show host who did a weekend TV show for the cable channel referred to an unidentified caller to his show Saturday as a "sodomite" and said he should "get AIDS and die." For even more examples of Savage’s extreme rhetoric, click here . Eric Hananoki and Kelly Matthews contributed research to this post.